He has been billed as the next Andrew Strauss, but Middlesex batsman Nick Gubbins insists he will follow his own path to cricket stardom. The 21-year-old, born in Richmond but now living in Chelsea, is being tipped for a big future after breaking into the first team last year while still at university. And he was selected again for the opening match of this season as he made 23 and 37 against Nottinghamshire at Lord’s. Comparisons to former Middlesex and England captain Strauss are perhaps inevitable. Like Strauss, Gubbins is a left-handed opener who boasts a strong cut shot and a mental fortitude to match. And, like Strauss, he was educated at the £11,000-per-term Radley College in Oxfordshire, where cricket master Andy Wagner mentored both players. Gubbins has been able to bend the ear of his idol for advice on the psychological side of the game, but says he will develop his own style as he looks to emulate Strauss’ decorated career. He told West London Sport: “A lot of people have said there are similarities but I’m trying to do it my way. “I’m not going to pull and cut just because Straussy did it, I’ll do it because those are my strengths. “Straussy has helped me in the past – he became my mentor for quite a bit. I try to leave him to it now because he’s quite a busy man but if there’s something I desperately need then I will go to him. “He’s taught me a lot of mental stuff, such as having gameplans to bowlers. He suggested a book to write down your thoughts when facing bowlers or playing on certain pitches, something to go back to when things aren’t going so well. Gubbins’ maiden year as a Middlesex first-teamer was split into two distinct halves. Called up after Sam Robson made the England squad, he hit 54 on his County Championship debut, against Northamptonshire in June, and followed it up with 59 and a first-class best 95 in the next match against Somerset. However, he failed to reach double figures in the three innings that followed and was sent back to the fringes when Robson returned. 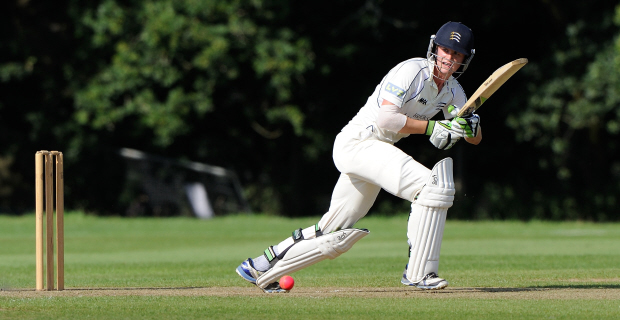 Gubbins admitted: “I didn’t think I’d play for Middlesex firsts until after university. I’d say, honestly, it was probably a year early. “Luckily, Robbo got selected for England which opened up a space and once you get that break it’s important to take your opportunity. The close-season arrival of Nick Compton from Somerset, replacing former skipper Chris Rogers, hasn’t pushed Gubbins out of the reckoning. He opened with Robson against Notts, while Compton came in at number three, and Gubbins says batting alongside two players with England experience can help him achieve his own ambitions. He said: “I’ve talked a lot with Compo since he’s arrived and I’ve been opening with Robbo, which has been a great experience. “I’m looking to learn as much as I can from them because they’re quality players. And what about following in the footsteps of Robson, Compton and Strauss in one day walking out at Lord’s in an England shirt?